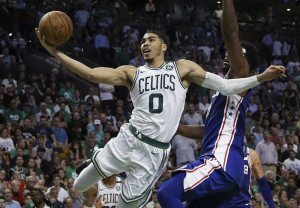 CHICAGO -- With a 48-26 lead at the 6:41 mark of the second quarter, the Philadelphia 76ers seemed to be on their way to a huge Game 2 victory and knot the Eastern Conference semifinals series at 1-1 on Thursday night at the TD Garden in Boston. But the gritty Celtics came roaring back and pulled a stunning 108-105 come-from-behind victory to take a 2-0 lead. Jayson Tatum led Boston's fiery assault with 21 points while Terry Rozier drilled four treys to finish with 20 points and nine assists. Marcus Smart tallied 19 while Al Horford added 13 points and 12 rebounds. Jaylen Brown came off the bench with 13 more. Boston ended up making 37 of 82 field goals and 15 of 36 triples. The Sixers were not as efficient, finishing with 13 of 33 from long distance and 40 of 92 overall. J.J. Redick paced Philly with 23 points while Robert Covington had 22. .Joel Embiid accounted 20 and 14 boards but Ben Simmons, the leading Rookie of the Year candidate, only had one point on 0-for-4 shooting.